Never, ever start your freelance writing work without some kind of agreement in writing. With some clients, this will eventually become a simple email, but only after a long and mutually respectful working relationship is formed! For everyone else, a contract is a must. Verify the Need. About 90% of my clients have their own contract that they prefer to use. Are you positive this ball is in your court? Name It. 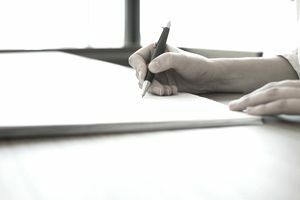 If you definitely need to write a contract from scratch, consider doing an end run around all the legalese, and write a "Letter of Agreement" instead. It’s essentially the same item but in a simpler format. Create a Header. Include your contact information and logo if applicable. Date It. Use today’s date here. Later on, we’ll customize due dates. Personalize It. Name the other party, and include all their contact information. this also serves the purpose of letting them know that you know where to find them if they don't pay! Format it. Should you choose to use a Letter of Agreement (LOA) format, you can then easily format this document as a letter. Should you choose to stick with a more formal contract, consider numbering each of the subsections below. Outline the Services. Outline exactly what you will and will not provide. Example: you may have been contacted to rewrite a Wiki for a local celebrity, but you have not agreed to additional research and entries. Detail Everything. This is the substance of your contract and will serve to protect your time and efforts. Carefully detail everything. How many edits are included? Who’s responsible for pickup/delivery? In what format will you deliver the final product? Cite Due Dates. This is where you outline the timing of the project, including benchmarks, due dates, delivery dates and so on. Cover Pay. We like this part. Include details about total payment, down payment, kill fees, and late fees. Also, outline specific dates that payment will occur. You may want to include verbiage about your invoicing methods here, too. Agree on Rights. This is where you and your client will agree on rights transfer of the copy. Once the project is delivered, will it still carry your name? Do you have any additional rights to it? Can your client use it once, or as often as they want? I've provided a series of sample contracts, including a sample formal contract, a sample Letter of Agreement (a bit less formal), and a sample Statement of Work. In addition, the business management expert here has provided some samples, including this sample non-disclosure agreement, and the Fiction Writing Guide has a great sample of a non-compete agreement. You may want to read up on your state's laws concerning work for hire or service contracts. Additional contract samples are available at Nolo.com and through the Freelance Writers Union. This is not intended to be legal advice. The writer is not a lawyer. For an airtight contract, please see a lawyer.